Nasa scientists are over the moon after announcing the discovery of flowing water on the red planet for the first time ever. They believe that dark stripes on the surface have been caused by trickling water that freezes and unfreezes during different seasons on the planet. Further tests are being carried out, to confirm the findings of the Mars Reconnaissance Orbiter spacecraft, but already space scientists have started to speculate about what the existence of liquid water on Mars could mean. One thought is that the liquid water could be coming from under the planet's surface. Professor Tim O'Brien. from Manchester University, told Newsround: "This is the key question. One alternative is that it's coming up from underground reservoirs in some way." This would change lots of things that scientists thought they knew about Mars but Professor O'Brien also offers another view. He added: "Alternatively it could be absorbing water from the atmosphere." He says that would make the water on the planet extremely salty and not suitable to drink. Does it means there's life on Mars? On Earth, every time we find liquid water we find life and so scientists believe that surface water might help identify possible habitats for life on Mars. Although there is no suggestion that scientist have found life on the planet, experts now know that Mars has the type of environment where life could potentially exist. 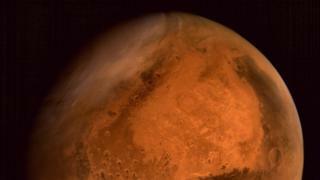 Space scientist Sarah Crowther told Newsround the discovery does not confirm there is life on Mars in any way. She said if it is true it simply shows that there may be the conditions there to support some kind of living organisms. Could there now be a manned mission to Mars? In 2012 NASA's Curiosity rover landed on the Red Planet's surface, as part of a robotic mission to search for evidence of life. Watch our report from when Curiosity first landed in 2012. But scientists know that if we want to find out more, we will eventually have to send humans to explore. There's now the potential for future exploitation of water as a resource for manned missions to Mars. If it's proved that there is water on the planet it could be used to make rocket fuel or provide water for humans to stay there longer. Scientists are currently trying to build the rockets that will one day take researchers there, but that kind of mission could be many years away. Could people live on Mars? Scientists believe that of all the planets in our solar system Mars is the only other place where humans could realistically live in the future. Water is essential to human life and all human beings need it to survive. 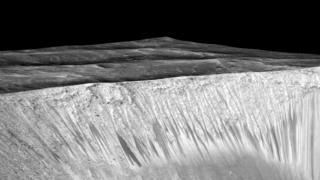 If scientists prove that there is water on Mars, the planet could potentially form a human habitat. 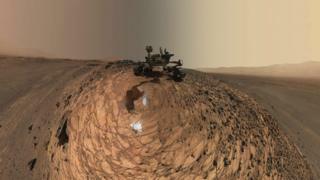 Newsround's report from 2012 on plans to explore Mars further. However, the average temperature on the red planet is -62 degrees Celsius so there's no way humans could set up camp there without a lot more work to help them cope with the conditions. Is there any danger in exploring more? The presence of water could have a big impact on future exploration of Mars, in terms of what regions scientists can or can't explore. Nasa scientists who announced the water discovery now have to think about what to do next. Areas with water are off limits under current planetary protection regulations, a set of rules designed to control space exploration. It's to stop these areas being contaminated with germs and other organisms from the Earth. Scientists don't know what effect that would have. 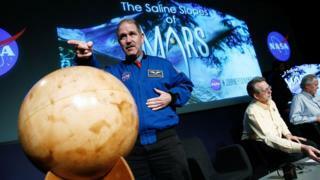 Professor Tim O'Brien told Newsround: "We wouldn't want to contaminate it with life from earth. "The problem is if our space craft go there, certainly if we go there we'll be taking lots of organisms with us, bacteria, microbes and so on. "So how do we protect this possible life on Mars while also protecting it? That's the challenge."